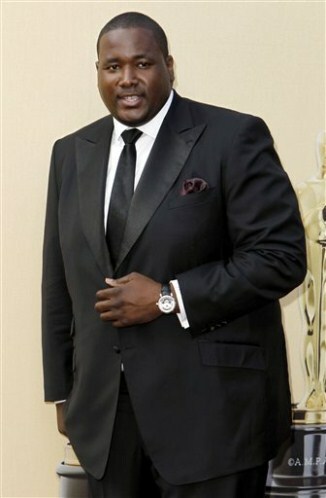 Last night we watched the biggest award show of the year, as The Blind Side’s Quinton Aaron towered over the red carpet looking dapper in his custom Astor & Black tuxedo. Tonight, we’ll be tuning into The Tonight Show with Jay Leno as “Ross the Intern” joins Quinton at his tuxedo fitting with Astor & Black’s LA clothier Aaron Benami. This was Quinton’s first appearance at the Academy Awards, so not just any tuxedo would do. If you saw the movie, you know that Quinton, who played Baltimore Ravens’ offensive lineman Michael Oher, is definitely not small in stature. At 6’10” and 350 lbs, Quinton needed on the best in custom clothing. Aaron worked closely with Quinton’s celebrity stylist, George Blodwell, to create the perfect 2-button, fully-canvassed, wide-peak lapel tuxedo completed with side vents, slanted pockets and a ticket pocket. So be sure to tune into The Tonight Show with Jay Leno at 11:30 ET/8:30 PT.